A daytrip into the "woods"
Spring and autumn are the seasons for firewood collection. Even before dusk the firewood collectors, mainly ladies and children, head off for the last remaining wood supplies of the valley. Naming it “wood” is rather an euphemism: As the bulk of “real” forests in the valley have been cleared already, one should better call it “ligneous grasses” what the people bring home as a yield these days. These are mainly different species of Artemisia as well as a ball-shaped thorny scrub of half a meter in diameter, vernacularly called “zash”. The latter needs around 35 years to grow up to this size – whereas, with a loud cracking noise, the plant burns down within 5 minutes. An attentive trekker in the Pamirs will be puzzeled by the cow-droppings next to the path which obviously have been turned upside down: This denotes that someone has already reserved this piece of cattle manure, but it shall first dry before the future usufructuary will come again to gather it. Dung is, besides wood and shrubs, is the second most important energy source. According to shape, consistency, producing species and fuel value, the Pamiri languages know several different terms for it! Energy is in Bartang first and foremost needed for cooking, for heating water for washing and in the winter for at the same time heating the house. Electricity, however is in the Upper Bartang villages either not existent, or the respective village maintains some micro-hydro unit, which supplies barely enough energy for a dim light bulb and television – and during summer time, due to the particulate matter in melt walter, is broken most of the time anyway. Some families, in addition to shrubs and dung, buy some coal. Because the road on which it has to be transported is very long, and as the bridges in Bartang cannot carry heavy lorries, this is however an expensive solution. Other households cook with gas as a supplement – if they can afford it and have been successful to convince a driver to bring the bottles up to Bartang, despite the often leaking caps and the danger of an explosion on the bumpy roads. Another unintentionally positive effect of the energy crisis is, that the picturesque landscape in Bartang does not get optically disturbed by scattered rubbish – everything burnable will inevitably end up in the stove. In order to learn more about the straining daily life of the wood collectors, see the short film of Roman Droux from minute 7:00 on. Click here. The energy problem is a typical symptom of the great transformation after the end of the Soviet empire. 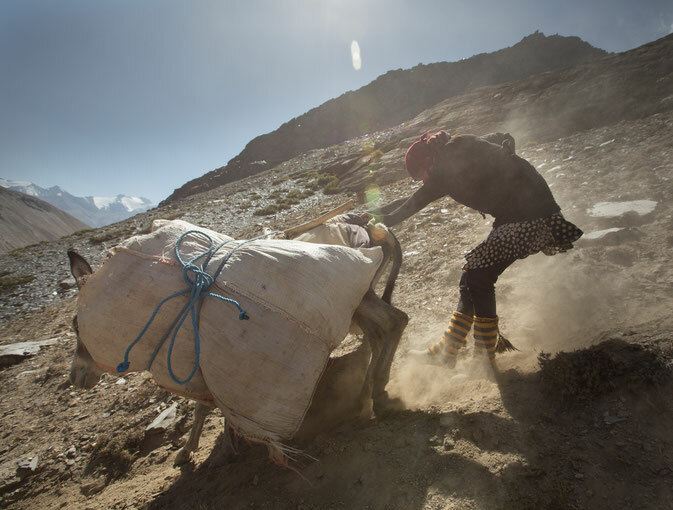 Namely, the Pamirs once formed one of the southernmost edges of the Soviet Union. The Soviet government had once regarded the region as on of the “least developed” of the whole empire, and had aimed to set an example through a comprehensive modernisation of the Pamirs (according to Soviet standards). 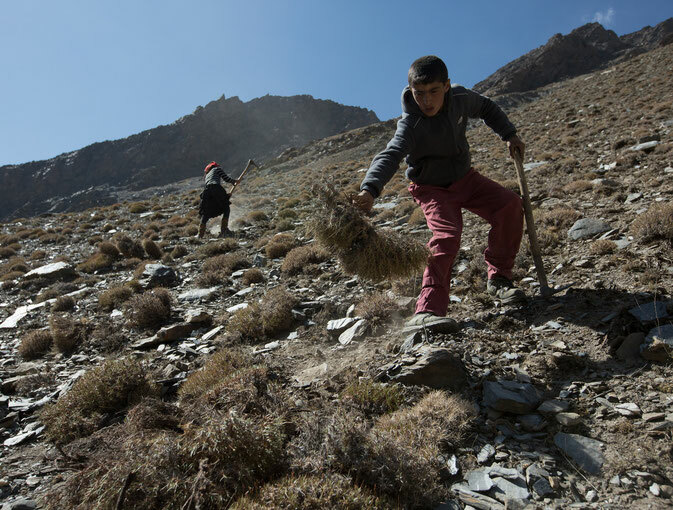 Even though the shortfall of the Pamirs could not be caught up completely till the end of the Soviet era, still the Pamir had been pampered through plenty of infrastructural measures for decades, such as the supply with heavily subsidized coal even in the most remote places such as Bartang. Another heritage from Soviet time is the sudden population explosion: The Soviet policy encouraged the families to have as many children as possible – for her tenth child a mother received a special reward. At the same time, thanks to the improved medical supplies with one of the highest concentrations of physicians per surface unit in the world, most children reached maturity. The sudden breakdown came in 1991 with the collapse of the Soviet Union, the declaration of Independence of Tajikistan and the subsequent civil war from 1992 till 1992, which threw back the Tajik infrastructural development for decades. The Bartangi were urged to meet their needs with the same means as a hundred years ago – now, however, with a multiple of the population of that time. Furthermore, they now found themselves in a state with one of the weakest national economies in the world. 1. As most dung gets burned, it is not available as fertilizer for the fields. Subsequently the yields hover below what could be actually achieved. 2. One of the greatest economic potentials of Upper Bartang that could even get extended in future is animal husbandry. However, the flock competes with the firewood collectors for the last remainders of vegetation. Therefore the cows and goats are too lean and give only a small trickle of milk. 3. Many families in Bartang desire to have an own income. Unfortunately, job opportunities are still scarce. An electrification would widen the spectrum significantly: Possible could be, inter alia, crafts enterprises such as sewing rooms and weld shops – some Bartangi have quite good skills in these crafts. Also indirectly the solution of the energy problem would have a positive side effect regarding income generation. A good example for this is Bardara village in the middle Bartang: This village has quite a strong hydropower station which provides sufficient energy for everyday life, so that the women do not need to gather a lot of firewood anymore. The released time they use for knitting the traditional Pamiri socks in high quantity, and from the sale in the towns they draw good profit. 4. A lack of vegetation abets the anyway significant erosion and increases the risk for rockfalls, avalanches and mudslides. A village in lower Bartang valley has already been completely wept out by a mudslide. 5. 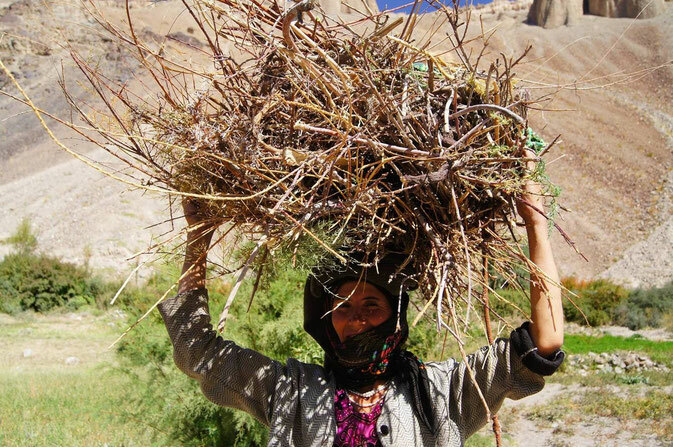 Many women who regularly go for collecting firewood complain about health problems, such as rheumatism. As it is often too far to return for each night from the far-away wood sources to the village, many prefer to spend the night in site. As virtually nobody owns a warming camping equipment, many incur a chronic sinusitis or pyelitis; two of the most widespread illnesses of the region. 6. As otherwise the workforce would not suffice, children often forcibly have to abstain from school for participating in the firewood gathering. Others who participate in the lessons, as well as the teachers themselves, are often still exhausted from firewood collecting the previous day and can barely concentrate on the lessons. Because the Bartangi have for a long time been considering education as a valuable good, they see the suffering quality of the lessons as one of the worst consequences of the energy crisis. They are afraid that Bartang, in comparison with other places, may further drop back in the educational sector. 7. Until recently it was unusual to marry outside the ten villages of Upper Bartang. Meanwhile, however, this happens as well, though in an asymmetrical proportion of the genders: Many young girls from Upper Bartang willingly agree when a marriage broker from one of the lower villages stands in front of their parental house. The reason: In the lower villages the energy crisis is less severe yet, meaning the bride-to-be will not have to carry the heavy burden of firewood collecting. On the other hand, just few girls would ever marry from other places to Upper Bartang, which is why many boys from Upper Bartang might remain bachelors in future. 8. Finally: Many Bartangi who generally appreciate their life in upper Bartang and would prefer it to migration, are not ready anymore to continue firewood collecting, especially not to impose that burden on their children. So their only choice is migrating to a city or directly to Russia, which however does not offer an all too welcoming milieu for migrants from Central Asia…. The Electrification of Upper Bartang is, admittedly, not an easy and cheap enterprise: Bartang is extremely remote and its environment is harsh. But anyway, there is no alternative if the community in Upper Bartang shall not be resettled collectively. Many stakeholders once promised a bigger hydropower station to the Bartangi, but so far only interim solutions have been put into practice. Now the point could be reached that the problem gets solved once and forever... Continue here to see how.